The ALTA PRO 2V 263AV Aluminum Tripod with ALTA PH-123V Head from Vanguard is a compact kit suitable for virtually all types of applications. Its light weight makes it ideal for travel, yet the 13 lb payload also allows it to be used in more professional applications. Moreover, the tripod legs can be opened very wide, allowing a minimum height of just 6", just slightly off the ground, letting you shoot stable low-angle shots as well as time-lapse capture. The maximum height is 51". The compact form and light weight of the kit allows you to comfortably carry it around by hand or in a bag, whether from one shooting location to another, up and down a hike, between your vacation activities, and pretty much anywhere else. The fluid head features a 58mm flat base with a 3/8"-16 threaded mounting hole (and a 1/4"-20 bushing is supplied), so you can conveniently attach the head to various other supports, including sliders. The head offers 360° pan and 60 to 90° tilt movement and features an adjustable spring-loaded counterbalance system which is engaged via a switch. A pan bar is included that can be attached to the left or right side. 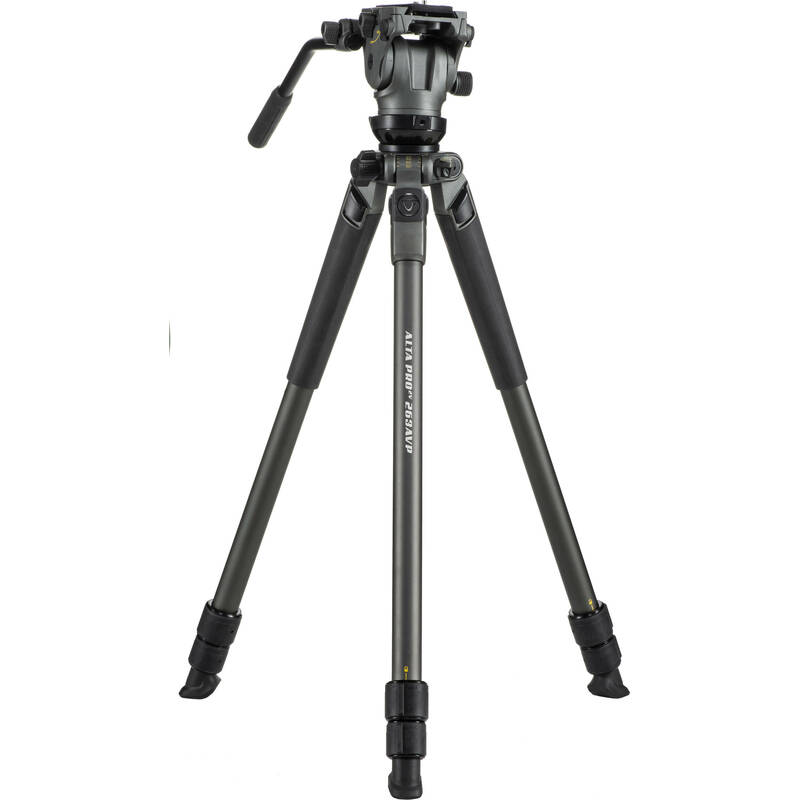 The Alta Pro 2V 263AT Aluminum Tripod from Vanguard maintains your horizon leveled with its built-in 75mm leveling half ball and its two bubble levels on the top plate. The top plate accepts a head with a 3/8"-16 socket and has locking set screws that secure the head. With a load capacity of 13.2 lb, the tripod supports a spotting scope, a video camera, or a mirrorless or DSLR camera up to that weight comfortably. The 4 lb, three section tripod has twist leg locks that disengage with a quarter turn, and at the top of each lock there is a marking that shows whether the lock is open or closed. Extending all the sections gets you a maximum height of 51.1" and with multi-leg angles, you can splay the legs out completely to a minimum height 6.1". There are four angles of 20, 40, 60, and 80° that are indicated with labeled degree markings. Additionally, the support folds down to 23.9" for transport or storage, and the tripod legs feature rubber feet that prevent sliding on smooth surfaces and provide a better grip on uneven terrain. The Vanguard ALTA PH-123V Magnesium Alloy Video Head is a compact and lightweight two-way fluid head with a 58mm flat base. It supports up to 17.5 lb and can be directly mounted on a variety of support products thanks to the flat base. Attach it to tripods, monopods, sliders, and other gear via the 3/8"-16 threaded mounting hole on the bottom or using an included 3/8"-16 to 1/4"-20 bushing. Box Dimensions (LxWxH) 24.5 x 4.9 x 4.8"
Box Dimensions (LxWxH) 13.3 x 4.9 x 4.6"